The Australian Plants Society NSW Ltd is made up of members from all walks of life who have a passion to learn about, share, grow and conserve Australian native plants and their habitats. We meet regularly at local and state levels, to allow members to share their insights and experiences in a friendly and collaborative environment. We have 19 active groups across NSW who would love to share their knowledge and experience with you. Over 60 years ago, a small, committed group of people pledged to ‘promote the establishment and breeding of Australian native plants for garden, park and farm’. They banded together to establish the Society for Growing Australian Plants in Victoria and within a year, societies had been established in six states, including NSW. A few years later, the federal association, now known as the Australian Native Plants Society (Australia) was formed to assist in integrating activities across Australia. We had a name change in the 1980s, from the Society for Growing Australian Plants NSW to the Australian Plants Society NSW. 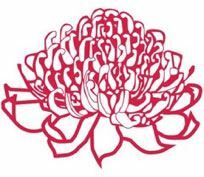 Our logo for many years, the hand-drawn waratah – and the floral emblem of NSW – was drawn by Betty Maloney, who along with her sister Jean Walker, first introduced the concept of bush gardening. This was the first real attempt in Australia to embrace our native flora. Their seminal book, "Designing Australian Bush Gardens" helped inspire broad interest in the growing and conserving native and indigenous plants in suburban gardens. Our new logo still embraces the waratah, but has a more contemporary look and feel, which we think represents the Australian Plants Society today. We continue our commitment to growing and conserving Australian plants.